16.4. テスト: 正しいものを作ったか/動く? Testing: Did we Build the Right Thing / Does it Work? So why does the waterfall process not work for software when it clearly works very well for other engineering products like bridges (after all, most bridges seem to hold up pretty well...)? First of all, we need to remember that software is very different from bridges. It is far more complex. Understanding the plans for a single bridge and how it works might be possible for one person but the same is not true for software. We cannot easily look at software as a whole (other than the code) to see its structure. It is not physical and thus does not follow the laws of physics. Since software is so different from other engineering products, there really is no reason why the same process should necessarily work for both. To understand why the waterfall process doesn’t work, think back to our section about analysis and remember how hard it is to find the right requirements for software. Even if you manage to communicate with the customers and resolve conflicts between the stakeholders, the requirements could still change while you’re developing the software. Therefore, it is very unlikely that you will get the complete and correct requirements for the software at the start of your project. If you make mistakes during the analysis phase, most of them are usually found in the testing stage of the project, particularly when you show the customer your software during acceptance testing. At this point, the waterfall process doesn’t allow you to go back and fix the problems you find. Similarly, you can’t change the requirements halfway through the process. 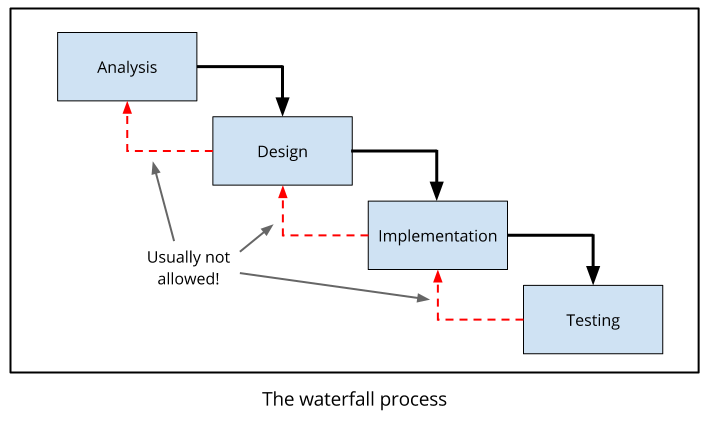 Once the analysis phase of the project is finished, the waterfall process “freezes” the requirements. In the end of your project, you will end up with software that hopefully fulfills those requirements, but it is unlikely that those will be the correct requirements. You end up having to tell the customer that they got what they asked for, not what they needed. If they’ve hired you, they’ll be annoyed; it it’s software that you’re selling (such as a smartphone app), people just won’t bother buying it. You can also get things wrong at other points in the project. For example, you might realise while you’re writing the code that the design you came up with doesn’t really work. But the waterfall process tells you that you have to stick with it anyway and make it work somehow. So if the waterfall process doesn’t work, what can we do instead? Most modern software development processes are based on the concept of iteration. We do a bit of analysis, followed by some design, some programming and some testing. (We call this one iteration.) This gives us a rather rough prototype of what the system will look like. We can play around with the prototype, show it to customers and see what works and what doesn’t. Then, we do the whole thing again. We refine our requirements and do some more design, programming and testing to make our prototype better (another iteration). Over time, the prototype grows into the final system, getting closer and closer to what we want. The advantage with this approach is that if you make a mistake, you will find it soon (probably when you show the prototype to the customer the next time) and have the opportunity to fix it. The same is true if requirements change suddenly; you are flexible and can respond to changes quickly. You also get a lot of feedback from the customers as they slowly figures out what they need. There are a number of different software processes that use iteration (we call them iterative processes); a famous one is the spiral model. 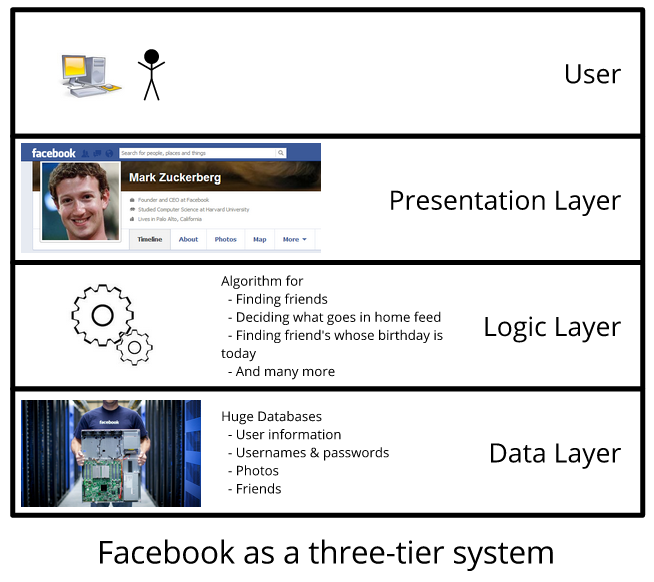 Although the details of the different processes vary, they all use the same iteration structure and tend to work very well for software. Apart from the question of what we do at what point of the project, another interesting question addressed by software processes is how much time we should spend on the different project phases. You might think that the biggest part of a software project is programming, but in a typical project, programming usually takes up only about 20% of the total time! 40% is spent on analysis and design and another 40% on testing. This shows that software engineering is so much more than programming. Once you’ve finished developing your program and given it to the customer, the main part of the software project is over. Still, it’s important that you don’t just stop working on it. The next part of the project, which can often go on for years, is called maintenance. During this phase you fix bugs, provide customer support and maybe add new features that customers need. Imagine that your project is running late and your customer is getting impatient. Your first instinct might be to ask some of your friends if they can help out so that you have more people working on the project. Brooks’s law, however, suggests that that is exactly the wrong thing to do! Brooks’s law states that “adding manpower to a late software project makes it later.” This might seem counterintuitive at first because you would assume that more people would get more work done. However, the overhead of getting new people started on the project (getting them to understand what you are trying to build, your design, the existing code, and so on) and of managing and coordinating the larger development team actually makes things slower rather than faster in the short term. The waterfall process is simple and commonly used but doesn’t really work in practice. In this activity, you’ll get to see why. First, you will create a design which you then pass on to another group. They have to implement your design exactly and are not allowed to make any changes, even if it doesn’t work! You need a deck of cards and at least 6 people. Start by dividing up into groups of about 3-4 people. You need to have at least 2 groups. Each group should grab two chairs and put them about 30cm apart. The challenge is to build a bridge between the two chairs using only the deck of cards! Before you get to build an actual bridge, you need to think about how you are going to make a bridge out of cards. Discuss with you team members how you think this could work and write up a short description of your idea. Include a diagram to make your description understandable for others. Now exchange your design with another group. Use the deck of cards to try to build your bridge to the exact specification of the other group. You may not alter their design in any way (you are following the waterfall process here!). As frustrating as this can be (especially if you know how to fix the design), if it doesn’t work, it doesn’t work! If you managed to build the bridge, congratulations to you and the group that managed to write up such a good specification! If you didn’t, you now have a chance to talk to the other group and give them feedback about the design. Tell them about what problems you had and what worked or didn’t work. The other group will tell you about the problems they had with your design! Now, take your design back and improve it, using what you just learnt about building bridges out of cards and what the other group told you. You can experiment with cards as you go, and keep changing the design as you learn about what works and what doesn’t (this is an agile approach). Keep iterating (developing ideas) until you get something that works. Which of these two approaches worked best — designing everything first, or doing it in the agile way? In this activity, you will develop a language for navigating around your school. Imagine that you need to describe to your friend how to get to a particular classroom. This language will help you give a precise description that your friend can easily follow. Now, go ahead and design the language. Come up with different commands (e.g. turn left, go forward 10, …). Make sure you have all the commands you need to describe how to get from one place in your school to any other! Finally, test the language using another student. Don’t tell them where they’re going, just give them instructions and see if they follow them correctly. Try out different cases until you are sure that your language works and that you have all the commands that you need. If you find any problems, go back and fix them and try again! Note down how much time each of the different phases of the project take you. When you have finished, discuss how much time you spent on each phase and compare with other students. Which phase was the hardest? Which took the longest? Do you think you had more time for some of the phases? What problems did you encounter? What would you do differently next time around? Communicating clearly with other software engineers and customers is essential for software engineers. In this activity, you get to practice communicating as precisely as possible! Divide up into pairs, with one creator and one builder in each pair. Each person needs a set of at least 10 coloured building blocks (e.g. lego blocks). Make sure that each pair has a matching set of blocks or this activity won’t work! The two people in each pair should not be able to see each other but need to be able to hear each other to communicate. Put up a screen between the people in each pair or make them face in opposite directions. Now, the creator builds something with their blocks. The more creative you are the more interesting this activity will be! When the creator has finished building, it’s the builders turn. His or her aim is to build an exact replica of the creator’s structure (but obviously without knowing what it looks like). The creator should describe exactly what they need to do with the blocks. For example, the creator could say “Put the small red block on the big blue block” or “Stand two long blue blocks up vertically with a one block spacing between them, and then balance a red block on top of them”. But the creator should not describe the building as a whole (“Make a doorframe.”). When the builder thinks they are done, compare what you built! How precise was your communication? Which parts were difficult to describe for the creator / unclear for the builder? Switch roles so that you get to experience both sides! Agile software development has become popular over the last 10 years; the two most famous agile processes are called XP and Scrum. Agile software development is all about being extremely flexible and adaptive to change. Most other software processes try to manage and control changes to requirements during the process; agile processes accept and expect change. 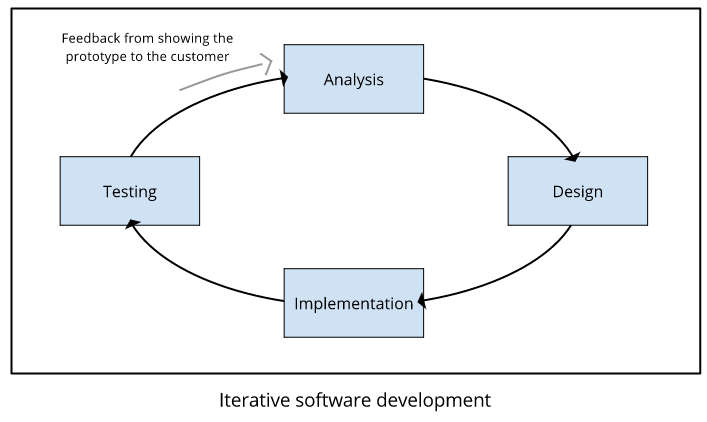 Agile processes work similarly to iterative processes in that they do a number of iterations of analysis, design, implementation and testing. However, these iterations are extremely short, each usually lasting only about 2 weeks. 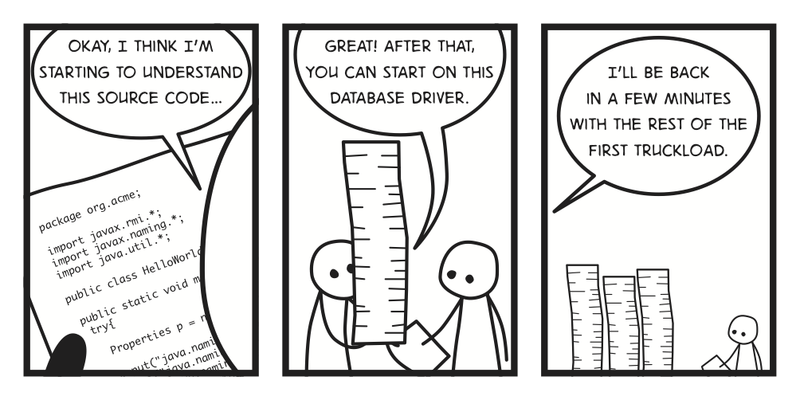 In many other processes, documentation is important. We document the requirements so that we can look back at them; we document our design so that we can refer back to it when we program the system. Agile software processes expect things to change all the time. Therefore, they do very little planning and documentation because documenting things that will change anyway is a bit of a waste of time. Agile processes include lots of interesting principles that are quite different from standard software development. We look at the most interesting ones here. If you want to find out more, have a look at Agile Academy on Youtube which has lots of videos about interesting agile practices! There’s also another video here which explains the differences between agile software development and the waterfall process. Programming is done in pairs with one person coding while the other person watches and looks for bugs and special cases that the other might have missed. It’s simply about catching small errors before they become bugs. After all, 4 eyes see more than 2. You might think that pair-programming is not very efficient and that it would be more productive to have programmers working separately; that way, they can write more code more quickly, right? Pair-programming is about reducing errors. Testing, finding and fixing bugs is hard; trying not to create them in the first place is easier. As a result, pair-programming has actually been shown to be more efficient than everyone programming by themselves! YAGNI stands for “You ain’t gonna need it” and tells developers to keep things simple and only design and implement the things that you know you are really going to need. It can be tempting to think that in the future you might need feature x and so you may as well already create it now. But remember that requirements are likely to change so chances are that you won’t need it after all. You ain’t gonna need it! 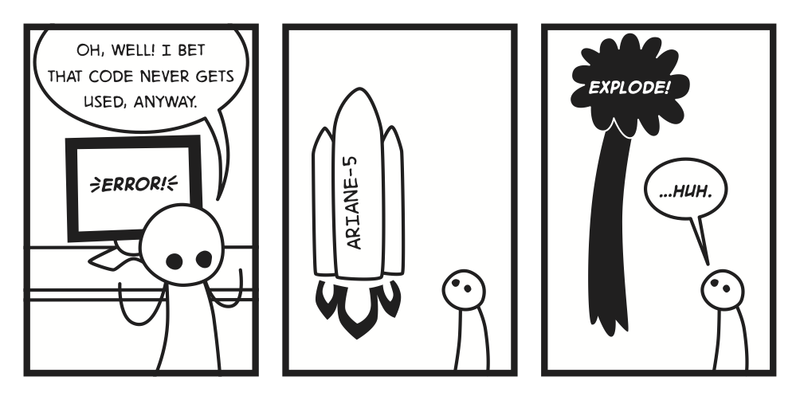 Agile processes take testing very seriously. They usually rely on having lots of automated unit tests that are run at least once a day. That way, if a change is made (and this happens often), we can easily check if this change has introduced an unexpected bug. 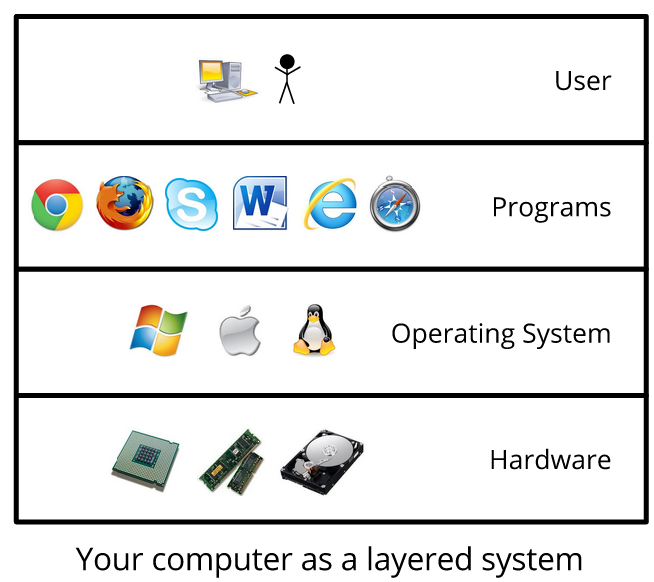 There are many different ways to design and program a system. YAGNI tells you to start by doing the simplest thing that’s possible. As the project develops, you might have to change the original, simple design. This is called refactoring. Refactoring means to change your design or implementation without changing the program’s behaviour. After a refactoring, the program will work exactly the same, but will be better structured in some way. Unit tests really come in handy here because you can use them to check that the code works the same way before and after the refactoring. Refactoring only works on software because it is “soft” and flexible. The same concept does not really work for physical engineering products. Imagine that when building a bridge, for example, you started off by doing the simplest possible thing (putting a plank over the river) and then continually refactored the bridge to get the final product. ”Courage” might seem like an odd concept in the context of software development. In agile processes, things change all the time and therefore programmers need to have the courage to make changes to the code as needed, fix the problems that need to be fixed, correct the design where needed, throw away code that doesn’t work etc. This might not seem like a big deal, but it can actually be quite scary to change code, particularly if the code is complicated or has been written by a different person. Unit tests really help by giving you courage: you’ll feel more confident to change the code if you have tests that you can run to check your work later. In standard software development, we first write some code and then test it. This makes sense: we need the code before we can test it, right? Test-driven development tells you to do the exact opposite! Before you write a piece of code, you should write a test for the code that you are about to write. This forces you to think about exactly what you’re trying to do and what special cases there are. Of course, if you try to run the test, it will fail (since the functionality it is testing does not yet exist). When you have a failing test, you can then write code to make the test pass. Software developers should not work more than 40 hours per week. If they do overtime one week they should not do more overtime the following week. This helps keep software developers happy and makes sure they don’t get overworked. A customer representative should be part of the developing team (ideally spending full-time with the team), on hand to answer questions or give feedback at all times. This is important to be able to quickly change the requirements or direction of the project. If you have to wait 2 weeks until you can get feedback from your customer, you will not be able to adapt to change very quickly! 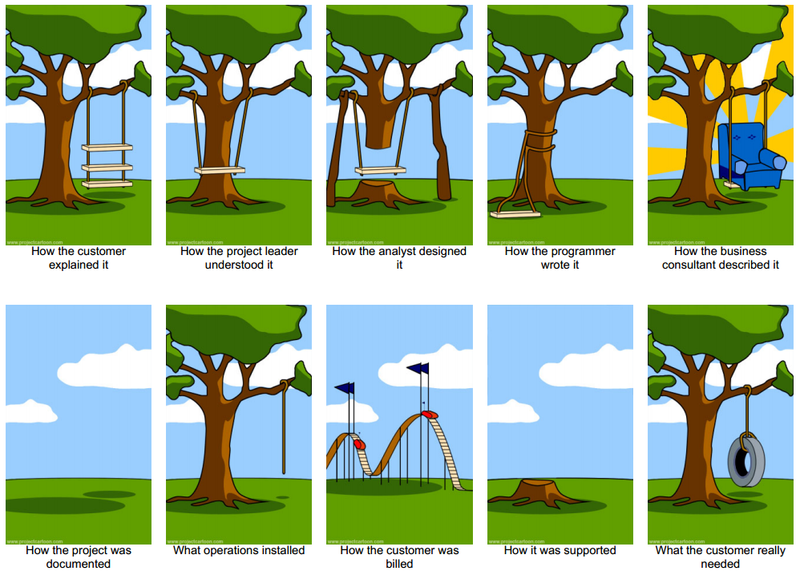 Although having a customer on the development team is a great idea in theory, it is quite hard to achieve in practice. Most customers simply want to tell you their requirements, pay you and then get the software delivered 5 months later. It’s rare to find a customer who is willing and has the time to be more involved in the project. So far, we’ve mainly compared software development to engineering and building bridges, but you might have noticed that it’s also pretty similar to architecture. In fact, software development (in particular agile software development) has borrowed a lot of concepts from architecture. An architect called Christopher Alexander, for example, suggested involving customers in the design process. Sound familiar? Several other suggestions from Christopher Alexander were also picked up by the agile development community and as a result his thinking about architecture has shaped how we think about software development. This is despite the fact that Christopher Alexander knew nothing about software. He was apparently very surprised when he found out how well known he is among software developers! This project will provide insight into a real software engineering process, but you’ll need to find a software engineer who is prepared to be interviewed about their work. It will be ideal if the person works in a medium to large size company, and they need to be part of a software engineering team (i.e. not a lone programmer). The project revolves around interviewing the person about the process they went through for some software development they did recently. They may be reluctant to talk about company processes, in which case it may help to assure them that you will keep their information confidential (your project should only be viewed by you and those involved in supervising and marking it; you should state its confidential nature clearly at the start so that it doesn’t later get used as an exemplar). You need to do substantial preparation for the interview. Find out about the kind of software that the company makes. Read up about software engineering (in this chapter) so that you know the main terminology and techniques. Now prepare a list of questions for the interviewee. These should find out what kind of software development processes they use, what aspects your interviewee works on, and what the good and bad points are of the process, asking for examples to illustrate this. You should take extensive notes during the interview (and record it if the person doesn’t mind). You then need to write up what you have learned, describing the process, discussing the techniques used, illustrating it with examples, and evaluating how well the process works. In this chapter, we’ve tried to give you an introduction to the challenges of creating software and some techniques that software engineers use to overcome them. We’ve really only scratched the surface of software analysis, design, testing and software processes; there are entire books about each of these areas! It can be difficult to understand the importance of some of the problems and techniques we have described here if you have never worked on a larger software project yourself. Some may seem blindingly obvious to you, others may seem irrelevant. When you work on your first large project, come back to this chapter and hopefully you’ll recognise some of the problems we have described here!